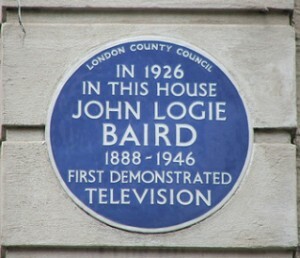 The IEEE UK and Ireland Section is arranging a full-day event at the Royal Institution of Great Britain (21 Albemarle Street, London, W1S 4BS, England) to celebrate the first public demonstration of television on 26th January 1926 at 22 Frith Street, London by John Logie Baird. The demonstration is recorded as being attended by some 40 members of the Royal Institution (RIGB). The event is free to attend, with sponsorship including the IEEE Life Members Affinity Group. It will include presentations about the television inventions of John Logie Baird, setting them into the context of prior and subsequent TV inventions and developments, and other achievements which have led to the present availability of television-related products and systems. The IEEE Board of Directors has approved an IEEE History Milestone Plaque to recognise the first public demonstration of television on 26th January 1926, to be installed in Frith Street, Soho, with an unveiling ceremony on 26th January 2017. Anyone may come to Frith Street to watch the unveiling which is expected to be at about 1400. A recording of the ceremony will be shown during the event at the Royal Institution on 27th January 2017.